District 18 is comprised of Simei, Tampines and Pasir Ris, a Far East residential district that has all the amenities and facilities a modern home needs nearby. Education, recreation, shopping, dining and entertainment destinations make District 18 a model site for comfortable living. 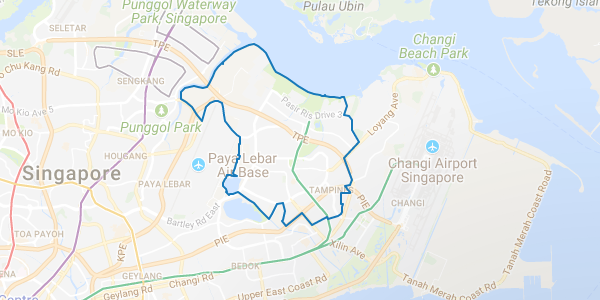 Simei is located between Tampines and Bedok, close to the Pan Island Expressway and the East Coast Parkway towards the eastern part of Singapore. A small self-contained housing estate that used to be a sea village. Due to land reclamation, however, the sea view is no longer visible. Simei has all types of residential properties, from Housing Development Board (HDB) flats to exclusive condominiums and houses. Recently, it has started to gain the attention of expatriates searching for homes in Singapore and many new launches are active within the area such as My Manhatten@ Simei, offering 301 units ranging from bedroom units to penthouses that come with full first-class facilities; SME Centre@Changi Simei, offering small and medium enterprises business support in the third satellite centre located at the Changi Simei Community Club; HDB’s Parc Lumiere offering 360 flat units featuring 4-5 bedrooms and the Double Bay Residences, a mass-market condo project featuring 646 units with choices of 1 to 4 bedrooms. With country clubs such as Tanah Merah Country Club and Laguna National Golf & Country Club, the elite can find abundant entertainment activities. For specialised education, the Institute of Technical Education’s campus encompasses nearly 10 hectares of land. Nearby, the Singapore Expo complex annually holds international concerts, exhibitions and conventions. Near Simei’s MRT Station, you’ll find the famed Char Kway Teow, Bak Kut Teh and Yong Tau Foo at the food court as NTUC Eastpoint Mall, Changi General Hospital and the famed 24-hour coffee shops nearby Simpang Bedok are located within the centre of the district, ensuring that neighbourhood residents are resourcefully sustained. Tampines started out as a fishing village and evolved into freshwater fish farms which was later relocated to Pasir Ris. The Old Tampines Road is historically rich, with many Chinese temples which still exist today, attracting many tourists to the area. Tampines is currently a residential estate comprising of HDB flats and condominiums equipped with commercial services and everyday facilities. Some of the new residential launches include the Santorini Condominium offering 597 units in 8 blocks of 15-storey sky blue finish that comes with a swimming pool and basement car parks. Purchasers can choose to buy dual-key units, duplex units or penthouses. The Trilive@Kovan is another prestigious condo development that features 217 residential units and 2 commercial units, a freehold development with full condo facilities, sky terrace and bamboo meditation garden. The district is served with two large shopping malls, Tampines Mall and Century Square and Tampines Library is just a stone’s throw away. A swimming pool and a gym can be found next to Tampines Stadium. For a long walk or run, try the Bedok Reservoir, which is often the venue for water sports including the HSBC World Wakeboard World Cup, whilst the Singapore Armed Forces’ Recreational Club (SAFRA) is located near Tampines Central. Currently the Tampines MRT Station serves the area, while another three MRT Stations under construction for future services. Pasir Ris is inhabited with many amusement parks, chalets, resorts and is renowned as a family vacation getaway for its fun, homely ambiance and infinite entertainment. The name Pasir Ris originates from the Malay word that translates into ‘white sand’, describing the sandy beaches around the area in the early days. Today, you can amuse yourself with your loved ones at Pasir Ris at Aloha Loyang, Fisherman’s Village, Pasir Ris Kid’s Kampong, White Sands Mall, Kyoto Koi, Pasir Ris Sea Sports Club, etc. As it is famed for its recreational hub, Pasir Ris is being aggressively developed into a family-oriented housing neighbourhood with many new launches such as Coco Palms@Pasir Ris, offering 944 units and 6 shops in 12 blocks of condominium; The Pallete@Pasir Ris, offering 892 bedroom or penthouse units; NV Residences@Pasir Ris, offering 8 blocks of 642 units of various bedroom choice and penthouses; and The Sea Esta@Pasir Ris, offering beachfront views with 4 blocks of 376 units of various bedroom choice and penthouses. Lifestyle and retail malls such as Elias Mall, Pasir Ris West Plaza, White Sands Mall and Loyang Point cater to residents’ shopping needs with the ease of public transportation of buses and taxis readily available along with the Pasir Ris MRT Station.